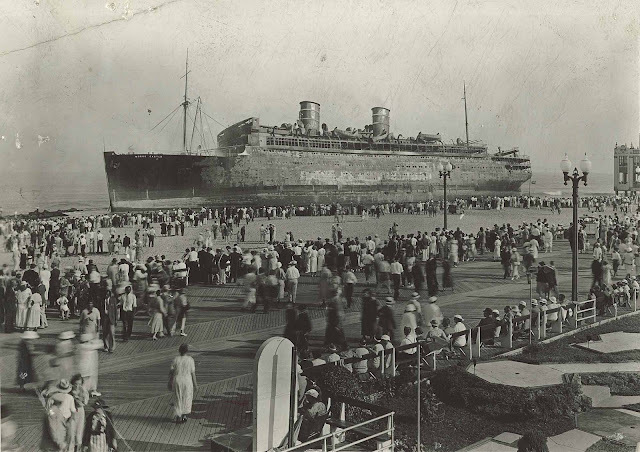 By mid-morning, the ship was totally abandoned and its burning hull drifted ashore, coming to a stop in shallow water off Asbury Park, New Jersey. 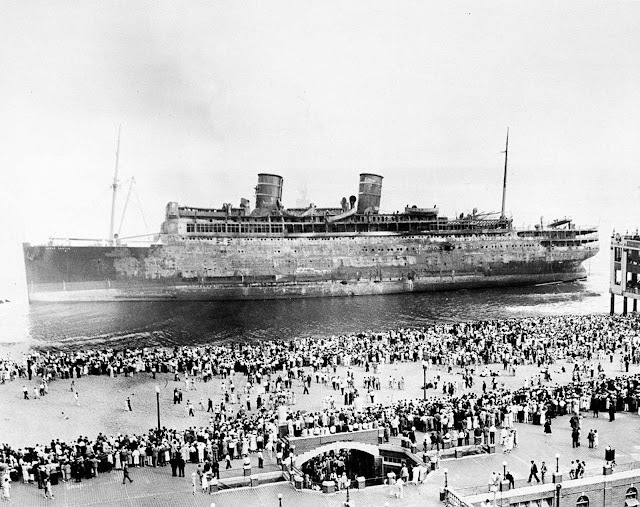 The SS Morro Castle, named after a fortress that guards Havana Bay, was a luxury cruise ship of the 1930s that was built for the Ward Line for runs between New York City and Havana. 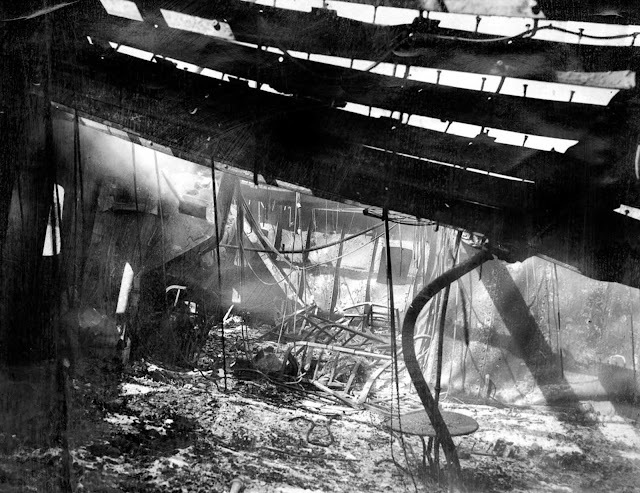 On the morning of September 8, 1934, en route from Havana to New York, the ship caught fire and burned, killing 137 passengers and crew members. At around 2:50 a.m. on September 8, while the ship was sailing around eight nautical miles off Long Beach Island, a fire was detected in a storage locker within the First Class Writing Room on B Deck. 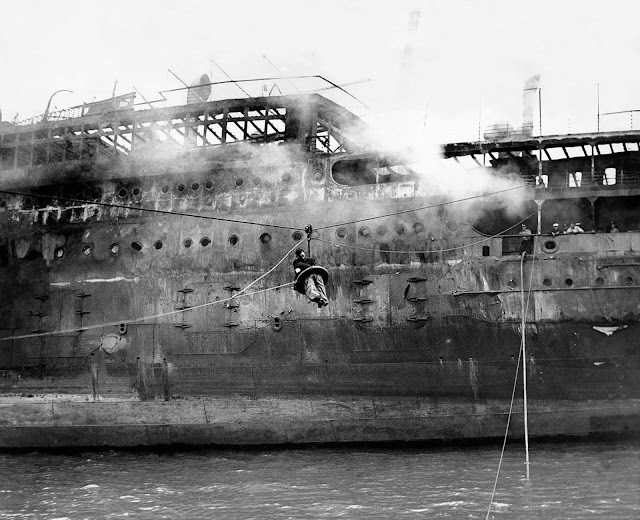 Within the next 30 minutes, the Morro Castle became engulfed in flames. As the fire grew in intensity, acting Captain Warms attempted to beach the ship, but the growing need to launch lifeboats and abandon ship forced him to give up this strategy. 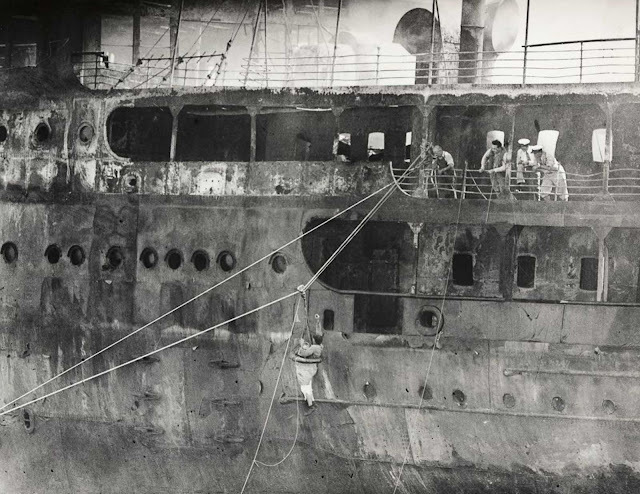 Within 20 minutes of the fire’s discovery (at about 3:10), the fire burned through the ship’s main electrical cables, plunging the ship into darkness. 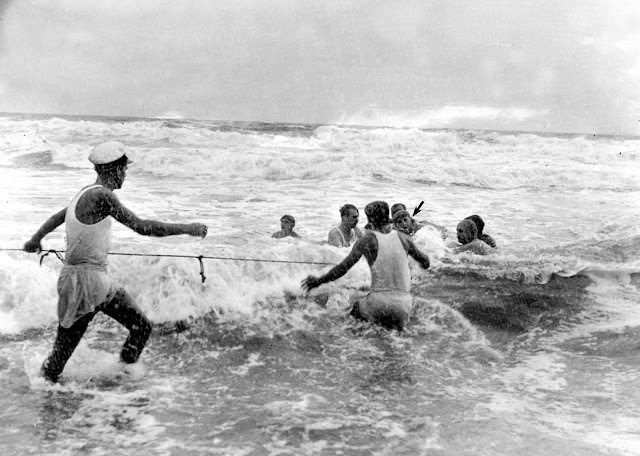 Coast Guard members rush to haul in a survivor from the surf in Spring Lake, New Jersey. Despite attempts to tow her to a safer location, the ship continued to drift toward shore. As telephone calls and radio stations spread news of the disaster along the New Jersey coast, local citizens assembled on the coastline to nurse the wounded, retrieve the dead, and try to unite families that had been scattered among different rescue boats that landed on the New Jersey beaches. 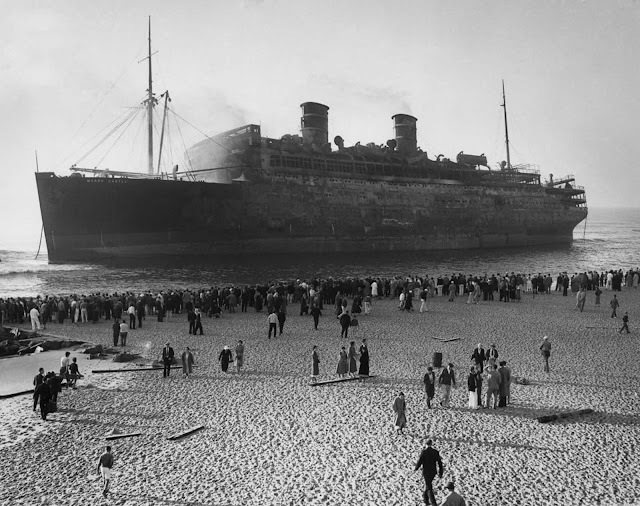 By mid-morning, the ship was totally abandoned and its burning hull drifted ashore, coming to a stop in shallow water off Asbury Park, New Jersey, late that afternoon at almost the exact spot where the New Era had wrecked in 1854. The fires continued to smolder for the next two days, and in the end, 135 passengers and crew (out of a total of 549) were lost. 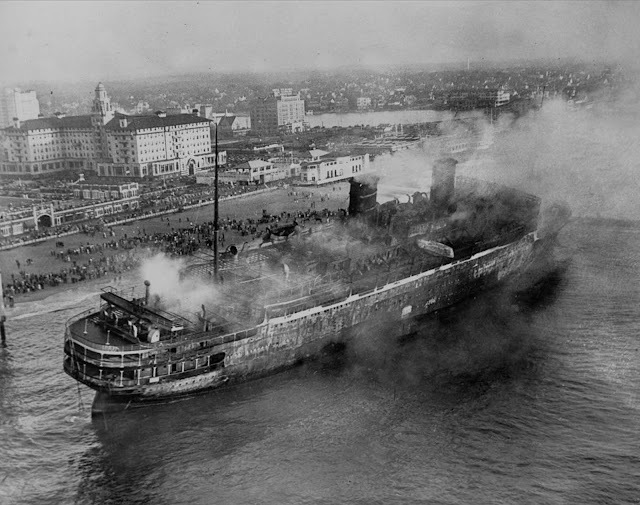 The ship was declared a total loss, and its charred hulk was finally towed away from the Asbury Park shoreline on March 14, 1935. According to one account, it later started settling by the stern and sank while being towed up the river. 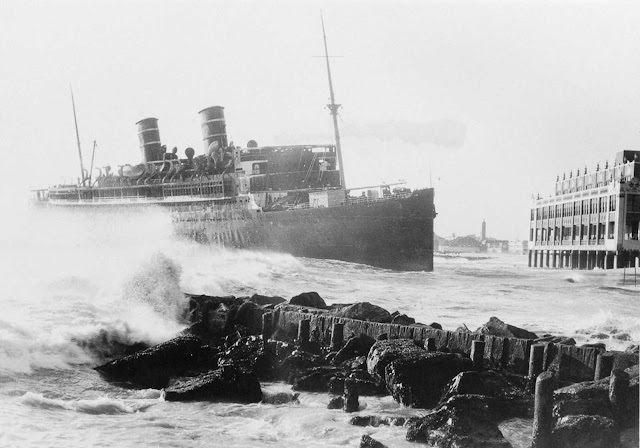 In the intervening months, because of its proximity to the boardwalk and the Asbury Park Convention Hall pier, from which it was possible to wade out and touch the wreck with one’s hands, the wreck was treated as a destination for sightseeing trips, complete with stamped penny souvenirs and postcards for sale. Irrespective of its cause, the fire aboard the SS Morro Castle served to improve fire safety for future ships. 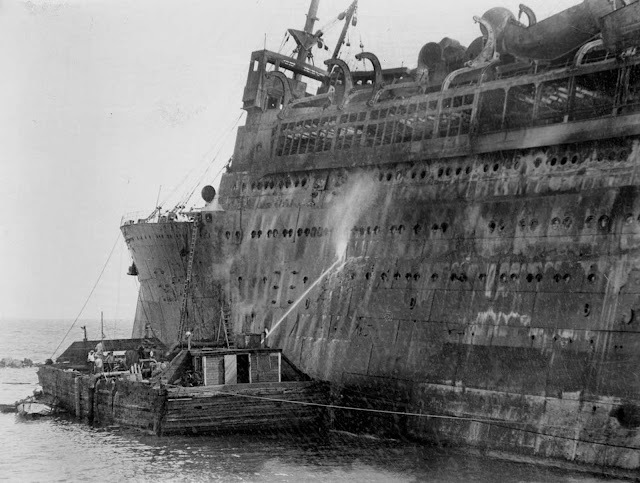 The use of fire-retardant materials, automatic fire doors, ship-wide fire alarms, the necessity of emergency generators, mandatory crew training in fire fighting procedures, and greater attention to fire drills and procedures resulted directly from the Morro Castle disaster. Due to the great loss of life the disaster caused, many reforms in the licensing of merchant marine officers occurred, such as the establishment of the United States Merchant Marine Academy. 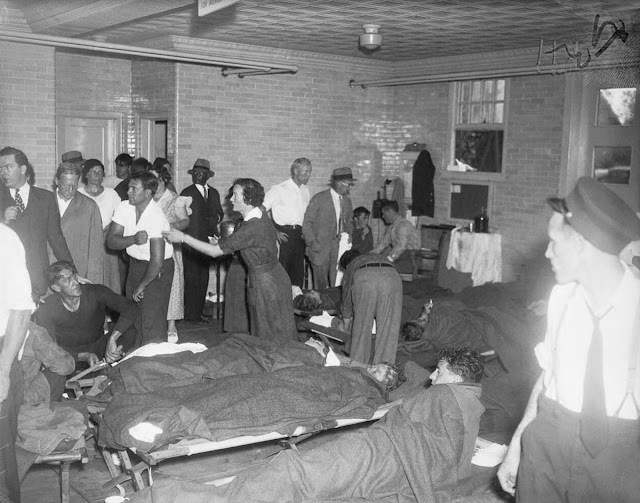 Survivors are treated in the Spring Lake, New Jersey firehouse. 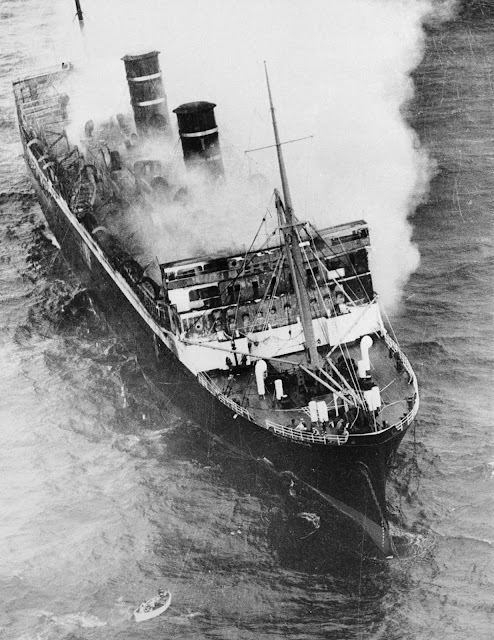 Smoke billows from the burning midsection of the ship as it drifts toward shore. The ship comes to rest on the beach at Asbury Park, New Jersey. Firefighters work to extinguish the still-smoldering wreck. Men climb aboard the wreck to search for bodies. Although there were 42 water hydrants on board, the system was designed with the assumption that no more than six would ever have to be used at any one time. When the emergency aboard the Morro Castle occurred, the crew opened virtually all working hydrants, dropping the water pressure to unusable levels everywhere. The deluxe staterooms on B Deck. The inquiries concluded that there was no organized effort by the officers to fight and control the fire or close the fire doors. More damning was the conclusion that, with a few notable exceptions, the crew made no effort to direct passengers to safe pathways to the boat deck. 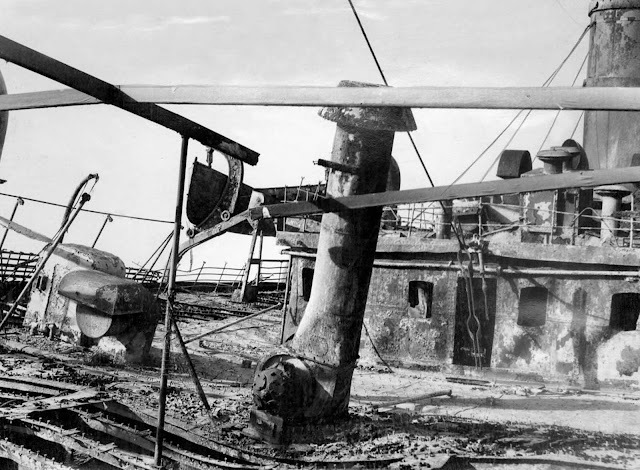 The wreck of the Morro Castle in the process of being pushed out to sea by salvage engineers. 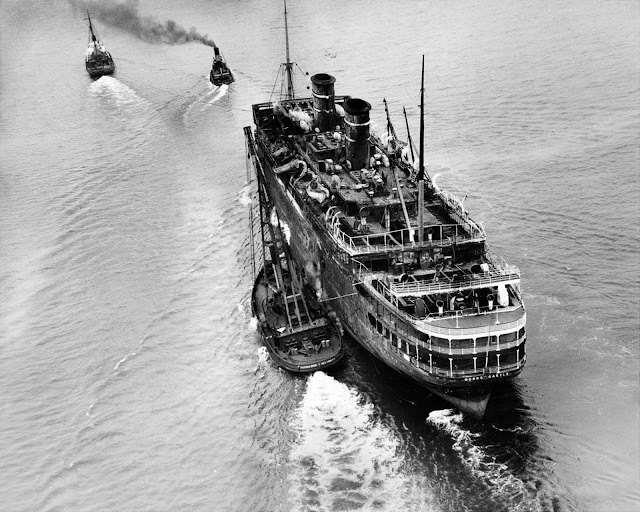 The wreck is towed away to be scrapped, six months after the fire. March 14, 1935.